Amelia Williams, Tree Officer for Test Valley Borough Council – a typical day in my life. So if you are passionate about trees, then the most natural choice would be to work with them, as I do. The best part of my job as a Tree Officer is being able to spend time outdoors surrounded by nature as well as engaging with local communities. I work for Test Valley Borough Council in the beautiful heart of Hampshire. My day usually starts around 8.30am at the main Council Offices in Andover, around 20 minutes from my home. From there anything can occur to change my plans for the day, often before I even get to work! 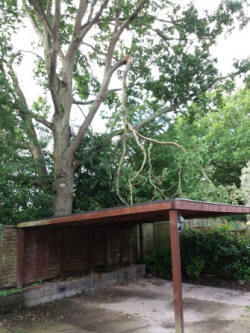 This can be because of storm conditions causing an emergency call out or reacting to multiple reactive Customer enquiries. A lot of my time is spent out and about in the Borough, which is around 50 miles long and 15 miles wide. It is assessing approximately 30,000 Council owned trees, groups and woodlands but not all in one day and for every hour of site time comes equivalent office time. I have mobile working though which enables me to grab my mobile phone and tablet with Ezytreev on it and go straight to site to assess whatever tree issue has come in. I can respond directly to our customers in a whole range of ways via e-mail, through the Council app, via text, phone or face to face. These site visits may be reactive or planned and I need to remain flexible to switch from one to the other at all times. As a Tree Officer, every day is different, every tree is different, every enquiry is different but the themes are similar. Overhanging branches, dangerous tree, fallen trees, lack of light, too tall, too close but whatever the issue, my role is to assess the issue and deal with it professionally, efficiently and effectively. It may be an insurance claim, nuisance, perception of danger or actual damage that I have to investigate. I get around 3 enquiries a day relating to trees too and a site visit is usually required for each one. So, one of the most important aspects of the role is you must like people, not just trees. Not everyone will share your passion for trees, but if you can understand people's issues with them you can determine the fate of trees in the long term. I see it as an opportunity to inspire others and share my knowledge and enthusiasm for trees with other people. My daily role includes surveying or re-surveying all the trees on Council owned land and that works out at around 26 trees per day. 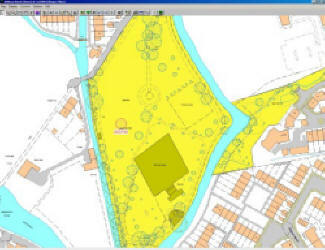 This entails checking for constraints, confirming landownership, making TPO applications to felling licences prior to ordering tree works and managing tree works budgets as well as putting up public notices, writing to residents and notifying the local Councillors of tree works. I carry out site checks of completed tree works and check work in progress by our tree contractors for compliance and assess completed tree works. So it is important to have a detailed understanding of tree law, health and safety and planning legislation. The job also includes drawing up replacement tree planting and providing guidance on tree related projects including BS5837 surveys, plus creating and updating guidance for the public on general tree information for the website and creating a tree policy. My day can be like a rollercoaster - very rewarding one minute to very frustrating the next. From seeing good standards of tree work being carried out, meeting new customers and sharing information on trees to frustration and emotions from people objecting to decisions about tree works or who feel upset at the way tree works were carried out. appreciate that not all your decisions will be welcomed positively but that should not deter you from making sound arboricultural decisions. It is part of my role to engage and listen to residents and local stakeholders and allow them to be part of the decision making process whether it is through consultation or notification just keeping them informed of forth coming tree works, so diplomacy and good communication skills are a must on a daily basis. You will liaise with so many interested parties whether it is a resident, Councillor, Business, or another professional body. I always try and see each interaction as an opportunity whether it is dealing with a customer complaint or compliment, general enquiry or project. There are many aspects to a Tree Officer role in Local Government. Whilst mine is focused on managing Council owned trees which in itself is a diverse and wide-ranging role, there are other elements to the role including Tree Preservation Order (TPO) applications, Conservation Area notifications, managing TPO’s, Planning consultations for trees, illegal felling, high hedge legislation, appeals and much more. Trees constantly grow, landscapes change and develop and that is what makes the role of a Tree Officer so interesting, diverse, challenging, and complex and at the same time rewarding.